There is no such thing as “Reformation Sunday.” Or, at least, there is no such thing as Reformation in the heart of God. There is only the Church. Our obsession with the nature of the earthly Church obscures God’s vision for the Church Universal. In God’s heart, the Church is ever as it was, the Body of the Faithful drawn into the love of the Trinity. The challenge for the earthly Church is our fixation on right or wrong. The Body is the fullness of relationship, not the vagaries of belief or doctrine. Sadly, we have determined that dogma somehow takes precedence over the harder and more essentially catholic work of being in relationship. 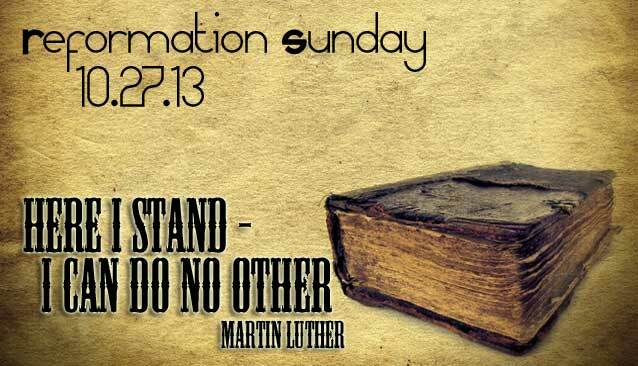 Reformation Sunday, as so many celebrate, elevates brokenness over wholeness. It celebrates the schism, the breaking, of the Body. It is a sad celebration at its heart. It reminds me of the families that insist that the funeral is a “celebration of life” rather than a recognition of the loss of and intercession for the deceased. It is a forced and disjointed thing that insists that pain is merely joy in another gauzy form. Those churches that celebrate “Reformation Sunday” are celebrating human blindness to the wholeness of Christ’s own Body. They are celebrating our inability to find wholeness in the midst of division. They are celebrating the triumph of “rightness” over relationship. They are celebrating the elevation of “right thought” over grace and comprehension. It is easy to be right – it is a far more challenging and sacrificial thing to be in relationship. Of course there were abuses in our past – and there are in our present. Yet where does division end? When can we be right enough? This is the challenge of the Reformation – when are we Reformed enough? The current state of Protestantism would be unrecognizable to Luther or even Calvin in its distance from tradition and, too often, reason. The wholeness of Catholicity is not about right or wrong – it is about sacrifice. The reformers sought to underplay and even eliminate notions of sacrifice in the Eucharist. There is a necessary self-abnegation that is inherent to notions of Eucharistic sacrifice that is inimical to hyper-Protestantism. Just as an over-emphasis on table fellowship puts us at the center of the Eucharistic action so too does an emphasis on our need to be right or for others to be wrong put us rather than the Living Presence at the center of the Church’s life. Catholicity calls us to self-giving – it calls us to be the Body – to hold up one another in brokenness rather than drive one another away. Christ’s sacrifice, the pierced Body of Christ, the Resurrection Victory of Christ – his self-offering, his forgiveness, his coming again– all that we remember and encounter in the Eucharistic action – call us to remember that our bodies – our earthly bodies and our souls are knit to his in both sacrifice and resurrection – in love for and service to the world around us. Therein lies one of the glorious mysteries of faith – God counts us precious – knows each of us in our trembling weakness and our tearful joys, in our rightness and our wrongness, for he has walked alongside us, suffered for us, and raises us to glory. We are given a prayer to pray daily, over time, and with intention that will open the depths of the Kingdom bit by bit, day after day, year after year. We know that even as we are welcomed to call God Father, we are not God, so we place his name above all others and we ask that his reality become ours – that his peace and righteousness may come to pass. We ask that He would fulfill the promises declared unto humanity – and he asks it of us – he lays it out for us in the next line. We receive our daily bread as a gift of grace and we are to forgive those who are indebted to us, who have wronged us, who owe us – because that is exactly how God has dealt with us. Forgive us our trespasses as we forgive those who trespass against us. The Church is a Body at the work of forgiveness – we are called to model what it means to strive to be in ever deeper relationship. This is not simply for the sake of being in relationship but for the sake of showing what it means to follow Christ. We are not called to draw lines in the sand but to erase the lines between us. May we all be forgiven for the need for Reformation – for the sins of those who create systems that seem, at times, beyond redemption, and for the sins of those who break away when wholeness is most needed. A thoughtful friend raised the question of a relationship that is abusive – are we obliged to remain in such a relationship? My answer would be, absolutely not. Yet there too is a cause not for celebration but for a recognition of human sinfulness and our capacity to do violence to one another. The question, for me, is how do we provide for systems of justice and mercy that hold us together and mutually accountable? That mercy and justice must include us as well – include our need to be treated with dignity – even as it places demands upon us. We must grieve the loss of relationships for they represent the places in which we have a chance for our faith to come alive. The way we treat one another is a point at which we manifest Easter living. The ending of a relationship is a thing of sadness as it means that we, either by choice or necessity, have found ourselves unable to dwell in peace. That is the crux of the sadness. It is no sin to flee abuse – but we need to mourn and address the injustice of the situation. I feel compelled to note, though, that the Church Luther rebelled against would not be recognizable to us. Luther wasn’t nailing stuff to the door of St. Anne’s up the street. The Reform was needed to be sure. But throwing Luther out made him sort of a living martyr, which always draws the far-out radical fringe into the fray. On the whole, though, I agree with your thoughts, painful though they may be. 8th Commandment….best construction, as advocated by Fr Martin Luther…….I have no idea how many Lutheran congregations you participated at Mass on Reformation Sunday and heard a sermon preached….but from what you have written, not many. The Holy Spirit is ever reforming, moving within and throughout the Body of Christ, the Church. The Church of the Augsburg Confession NEVER denied the centrality of the Holy Eucharist in the life of a Christian and indeed the Augsburg Confession states this very clearly. As far as Calvin is concerned…well, let your 39 Articles speak for themselves. In fact the sermon I preached yesterday was ALL ABOUT reconciliation and re-claimation of the Oneness that is found only in Christ Jesus, through faith alone, by Grace alone. Fr. Martin himself would be both displeased with a church in his namesake, especially since he wanted to reform the Roman church, not create a schism. I agree with the author that essentially Luther (or Reformation) idolization is not what the Day of Reformation is all about. Rather, Luther himself would say the point of proclamation on such a day is again to be centered on Christ: his suffering, death, resurrection, and ascension – the very story we, as an Easter people proclaim; it is about the very real presence of Christ that we experience in the centrality of the Holy Eucharist. Finally, the work of the reformation (while it may not happen in my lifetime – there is hope with the current Holy Father!) will not be complete until a Lutheran ecumenical destiny of reconciliation with the bishop and church of Rome. Thank you for your thoughtful words, Canon Hendricksen! Thank you for your post. I’m getting tired of excessive pride and celebration by my fellow Lutherans this time of year. Schism is not cause for celebration, nor bravado that “our side” was right. Anglo-Catholics are a blasphemous infiltration and they will not be destroyed until the damage is already done–in the Western hemisphere. I warn you now, that those in the East, whom you all may think are touting your sickness, are only thanking you for funding a coming behemoth: The Protestant faith that lives!